US F-18 jet crashes in San Diego: "A US military F-18 fighter jet has crashed into a residential area of San Diego, the Federal Aviation Administration (FAA) has said." The San Diego Fire Department described the scene of the crash as "a heavily populated area" near Interstate 805. 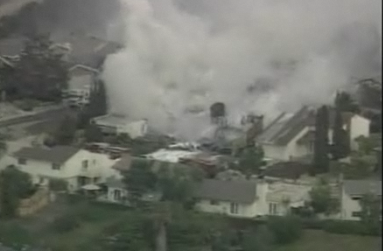 TV footage showed plumes of white smoke rising from several houses. It is not clear if there are any casualties. The jet crashed as it prepared to land at Marine Corps Air Station Miramar and the pilot had ejected, the FAA said. The crash occurred two miles (3.2km) from the base, it added. Donny James, who was visiting his mother in the area, said the supersonic fighter had been flying at very low altitude. "It spiralled out of control, just like out of Top Gun, and then it came down," he told CNN.